Can I make my own raw meat dog food? The answer is yes. When preparing the food it is important to keep the meals nutritionally balanced or you could end up causing more health problems. By the time you accumulate the proper ingredients, grind, mix, package and freeze the homemade raw meat diet, you'll find a raw dog food preparer can do all the work for you at a reasonable cost. Is feeding raw meat diets to dogs and cats a new concept? Feeding pets processed, cooked foods only goes back 100 years (and digestive evolution does not take place that quickly). Since food, until modern times, was scarce for people, dogs and cats ate scraps and were left to hunt, scavenge and forage for food to supplement what they received at home. Pet food companies have taken off only in the past few decades. Like many food and beverage manufacturers producing FDA-approved items that aren't healthy (think soda, candy, foods stuffed with preservatives, etc), pet food manufacturers are concerned more with customer convenience and profit over the health value of their food. Why have dogs recently been classified as omnivores? Webster's dictionary still classifies dogs as flesh-eating carnivores and direct descendents of the wolf (genus Canis). Are dog food companies responsible for promoting canines as omnivores as they introduce grains and vegetables to reduce costs? By looking at your dog's or cat's teeth, you will notice the teeth are different in shape than your teeth or a typical grazing animal's teeth (such as a cow's). The teeth you see are pointed and designed for grabbing, ripping and tearing meat. Canines lack large flat molars for grinding plants. Canine molars are pointed and situated in a scissors bite to help break down meat, bones and hides. 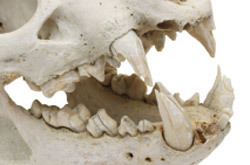 Carnivores also have a unique set of teeth which includes "carnassial" teeth, which are the fourth upper premolar and first lower molar. 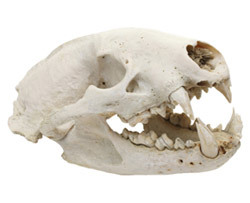 To compare with a true omnivore, the teeth of a black bear have both large canine teeth and large flat molars. Teeth directly correspond to the diet of an animal. Canine health depends on the food its body is designed to catch and digest. It is not designed to process grains and other plant matter. Ask yourself what foods humans don't eat that other animals thrive on because the food has no or little nutritional value to humans? Why do pet food companies continue to sell and promote grain-based foods? The primary ingredients in most foods (up to 60%) are usually corn, corn flour, rice, rice flour, wheat, wheat flour, soy and soy flour. Let your pet loose in a corn or rice field and your dog will be racing to catch animals, not chewing on plants. The digestive systems of canines are unable to properly digest corn and grains, which leads to health problems. Canine digestive systems have not evolved with the industry commercial dog food production. Dogs have short intestinal tracts compared to humans and especially sheep, horses and cows which are meant to accomodate large plant diets. Might my veterinarian say raw meat is unsafe? What would dogs eat in the wild? Do dogs eat grains in the wild? Are the dog's teeth and intestinal tract built to process grains? Do they know AFS has provided raw meat food zoos, wildlife parks, circuses and professional breeders for over 30 years? Look in the lobby to see if your vet is trying to sell/profit off the sales of processed dog food. Why do some animals do fine on commercial dry/canned food while others do poorly? Younger animals have a better ability to digest a variety of foods, but as animals age the effects of a poor diet become more noticeable. As organs age, especially the digestive tract and pancreas, it is easier to process foods with the digestive enzymes still intact and not damaged by the heating process. European owners of large dogs on raw meat diets have reported Rottweilers, Great Danes and Mastiffs living to 15 years or longer, very rare in the United States. Should vegans keep dogs and cats on a vegan diet? Each pet owner must decide for him or herself how to provide for their pet, but understand there is an ethical issue feeding an animal a diet that goes against the animal's biological make-up. Both dogs and cats are part of the scientific order, Carnivora, which are meat eaters. Plants are not easily processed by their shorter intestinal tracts and plant matter often lacks the amount of protein and calcium meat-eaters are designed to ingest. Unlike dogs, cats are true carnivores and cannot process beta-carotene from carrots and green vegetables into vitamin A. Cats receive vitamin A from liver and fish oils. Cats need the amino acid-like nutrient taurine and the essential fatty-acid arachidonic acid, which can only received in necessary levels from animal tissue. Providing a vegan diet to a dog or cat can have severe health consequences. Why is there there a different in stools with a raw meat diet? Because of raw meat's high biological value of the protein, there is less matter left for stools. Studies of digestion of raw meat products show a protein absoption in the 90% range. Commercial pet foods are filled with many indigestible ingredients which your pet will eat to feel full. However, most of this will be passed out in a stool. To test the quality of the stool, just remember well-digested stools in water "float like a boat." Can my dog or cat get diseases or worms from eating raw meat dog food? Feeding fresh table meat without cooking, processing or freezing can transmit infections, parasites and tapeworms. Red Rock Raw's quality control methods include instant freezing to -40 degrees F to deactivate the agents above and eliminate bacterial growth. Product ingredients are from a USDA certified meat processing plant in northeastern Wisconsin and manufactured using human grade environmental controls to maintain quality and freshness. Red Rock Raw meats DO NOT CONTAIN cow brain matter, spinal cord, hair, horns, teeth, intestines, hooves, beaks, bowels, etc. nor does it contain any other animals, such as horse, pig, kangaroo, etc. How does raw meat dog food reduce tartar? Dogs lack the enzyme to convert starches (found in grain-based dog foods) into sugars. Starches can easily stick to the gum line leading to tartar buildup and periodontal disease.